Here are the slides from the April meeting if you wanted to refer back to them or missed the meeting. There will be no formal December meeting. A few members will still meet at the Out-O-Town Club at Noon on Tuesday, December 18 for an informal luncheon. All are welcome if your schedule permits. Our next meeting will be Tuesday, January 15th and will be the Christmas Party. Cocktails will begin at 6 PM with dinner starting at 6:30 followed by a presentation by John Maino. The December Newsletter is on the Newsletter page. Very proud to accept this award tonight on behalf of the Clinic planning committee and all the attendees. 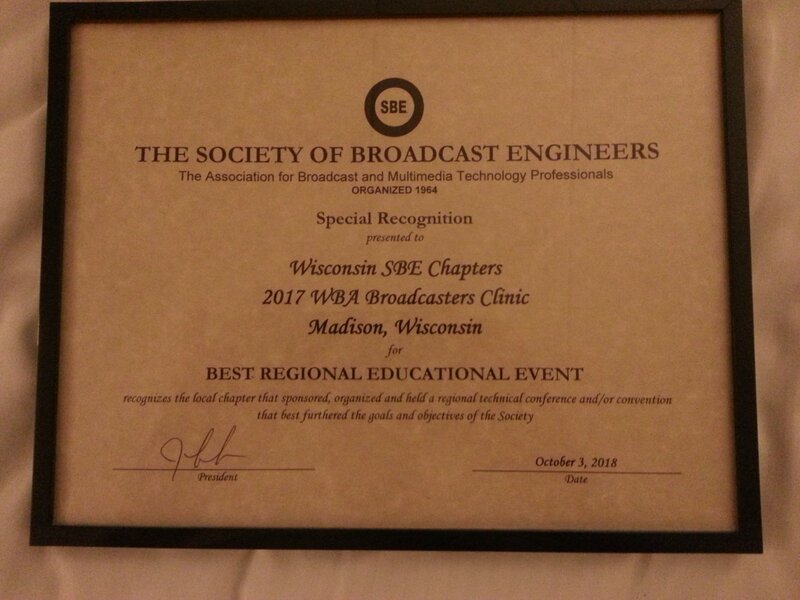 This award is from the Society of Broadcast Engineers National Meeting. The 2017 Broadcast Clinic was named the Best Regional Educational Event. Special recognition should go to our Chair Kent Aschenbrenner (Milwaukee Chapter 28), Linda Baun (who we all know does so much for Broadcast Clinic, and to Leonard Charles, immediate past Chair of the Clinic Committee. These individuals and countless others worked very hard in 2017 and every year to put together a great event. You can still make plans to attend this award-winning event – takes place in less than two weeks! For more information on this year’s event, click here.